What are the responsibilities of a resort towards guests who use the resort’s swimming pool? Florida law is clear. The owner of a resort owes its guests the duty to exercise ordinary care in providing a safe and proper place to bathe or swim. In the exercise of ordinary and reasonable care, the owner of a resort which offers swimming pools as attractions or amusements are required to furnish a reasonably sufficient number of attendants or lifeguards for the protection of bathers, and the total absence of lifeguards at a public swimming pool may be negligence. Details of the actual reason for the death of Anthony have not been made public by the authorities. We know that at approximately 9:30pm, Anthony was found at the bottom of the 4-feet deep swimming pool and pulled by his cousin. Immediate attempts to resuscitate were made by the child’s father, as well as a firefighter who was vacationing at the resort and who was present when Anthony’s body was pulled out of the water. Rescue arrived moments later. According to other guests’ testimonials, resuscitation efforts lasted for almost an hour before Anthony was put on a stretcher and transported emergently to a local hospital, where he was pronounced dead less than 48 hours later. An investigation into this tragedy will aim to answer several questions. If it is ascertained that the incident occurred at a time where lifeguards were not on duty, one must look into the reason for the pool to have remained open past 8pm. One can understand that any resort would want to keep its pools open for guests to use at their own discretion, but then why not man each pool with human security? In other words, why not extend the duties of lifeguards by several hours, like it is customarily done in other resorts? Secondly, despite the absence of any lifeguards at the time Anthony was in the pool, was the resort equipped with mandatory life-saving and automated external defibrillators (AEDs) in case a drowning were to occur? Not only that, was a staff person trained in the use of AEDs on duty at the time this incident took place? Unfortunately, this tragedy is not the first of its kind. Several years ago, parents have endured the loss of their 6-year-old boy who drowned in one of the Disney’s swimming pools. While the circumstances of that tragedy were a bit different, Disney did agree to an out-of-court settlement with the family who had lost their loved one. The lawsuit, in part, alleged that the single lifeguard posted at the pool failed to adequately supervise the guests who were using the pool. The family also alleged that Disney should have had more than one lifeguard on duty at the time because of the large crowd of people using the pool. Leesfield Scolaro has resolved many personal injury claims against resorts throughout the state of Florida from cases including wrongful death, electrocution, entrapment, to sexual assault and slip and falls. 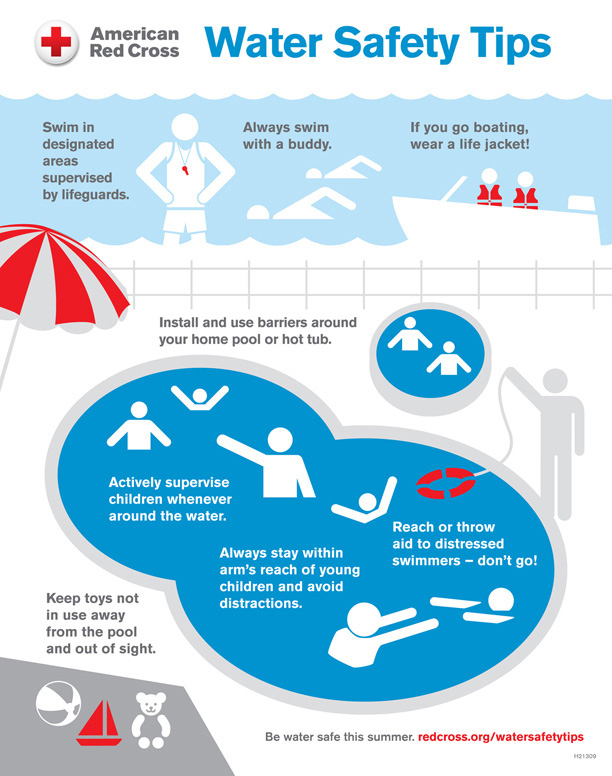 Below are useful safety tips posted by the American Red Cross.